Greetings, Colony Managers our latest release is ready for you. Tons of bake-fresh features sweeten the colony day. To wrap it up, making the other AI corporations your rivals is more dangerous than ever, now they attack with offensive items. Researching is now less casual and more time based. Some items are produced by districts in addition to being crafted. 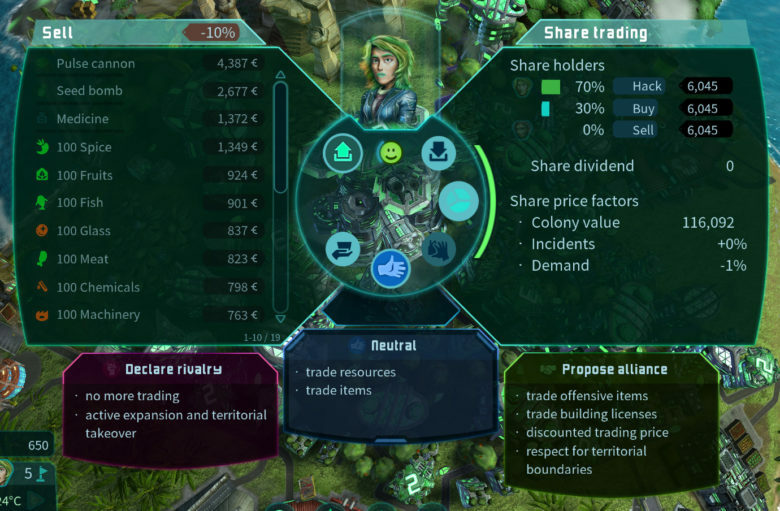 You can also hack the stock market in a new share panel attached to the tool ring on city centers of other colonies. We polished the new build menu and you can monitor upcoming threads much better in the reworked bookmarks panel. We hope you’ll enjoy the latest features! Please leave your feedback in our forum. We would be so happy if you’re interested in supporting our project as a beta tester. Which basically means you get the new update earlier than the rest. In case send us a mail. Additionally a 25% sale is coming to Steam on April 22. Mark our words! We can’t party hard enough on the commitment of Victor „Lartima“ who out of nothing send us a mail with the completed french translation of Imagine Earth! Thanks so many times to you and to Bouy, who got the translation started! Actually this is a good opportunity to thank all the 30.000 supporters that helped to keep the Imagine Earth project alive and well progressing with their early access purchases. This one is simply showing it all, all features, all threats, all items and all that we worked on over the last two and a half year – as the old trailer was kind of that old. On top it has something special, a final release date. Yes, we are hopeful to finish version 1.0 within 2019… Please share, post and tweet it as much as you can. You can buy the shares of other corporations directly from the tool ring on their city center. There you overview who’s owning the corporations shares and you can directly hack the stock market from here in case you made or bought a stock market hack which is a brand new offensive strategic item in the game. 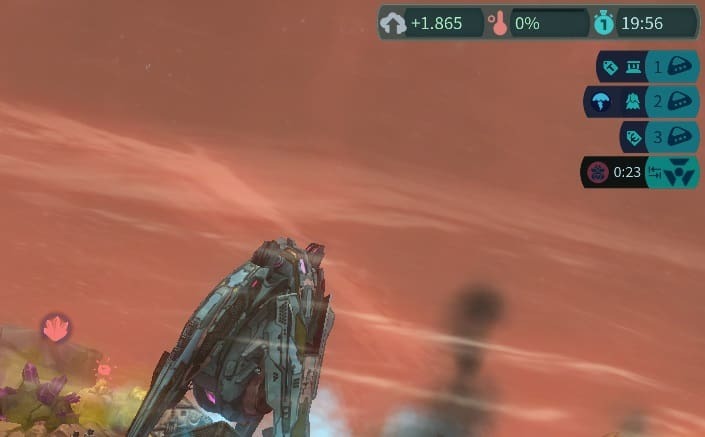 The bookmarks and events panel in the top right of the screen now warns you with a countdown before Pirates, Xrathul or Asteroids and other threats kick in. 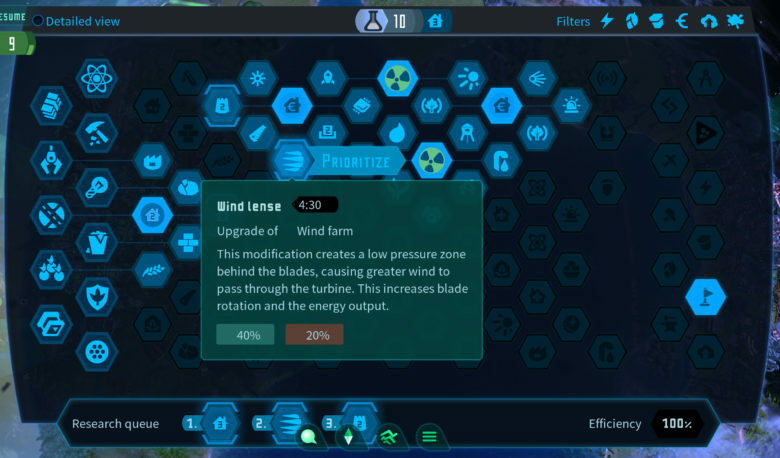 We needed to give players more time to prepare and you can even increase the warning time for an area by building research districts. At the same time we reduced alerts about stuff going on in the middle of nowhere. The panel now gives a better visualization of all the threads and catastrophes next to your cities and around the globe. From now on it takes a certain amount of time to research upgrades to make the decision of what to research first more strategic. You have a research queue that can by prioritized any time and you should pay attention to the efficiency factor which is raised by every research district you build. The city center also contributes to the factor as it has a built in research lab as well. We almost accidentally came up with the idea of letting the various types of districts produce items over time. That gives every district a more individual and special functionality. The new build menu nicely visualizes the items that are in production and it also shows the ones that can be crafted. Based on diplomatic relation and mood of AI factions they start using offensive items against you. Their tension to move against you is raised by an aggressive agenda. They will not hesitate to use pirates, assimilators, asteroids, sabotage and sometimes also explosive device and ideon bomb. The build panel is an UI element we reintegrated lately after having it replaced by the practical build ring several years ago. It allows you to permanently see your stock of items and gaia forces, also those who are actually still loading up and in production. This precious piece of user interface needed a cleanup and that’s what we did recently. 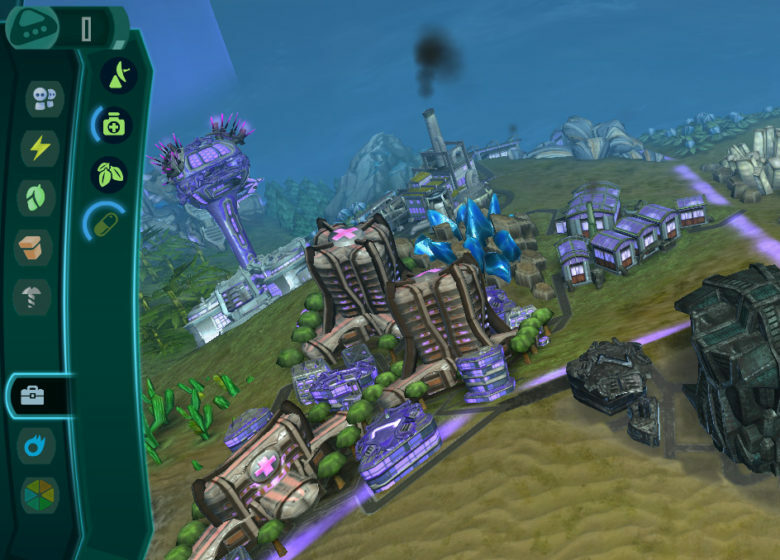 Also hovering buildings in the build ring or panel will show related resource icons on planet.